“Boyhood” was a brilliant and simple film about the trials and tribulations and oftentimes mundanity of growing up. 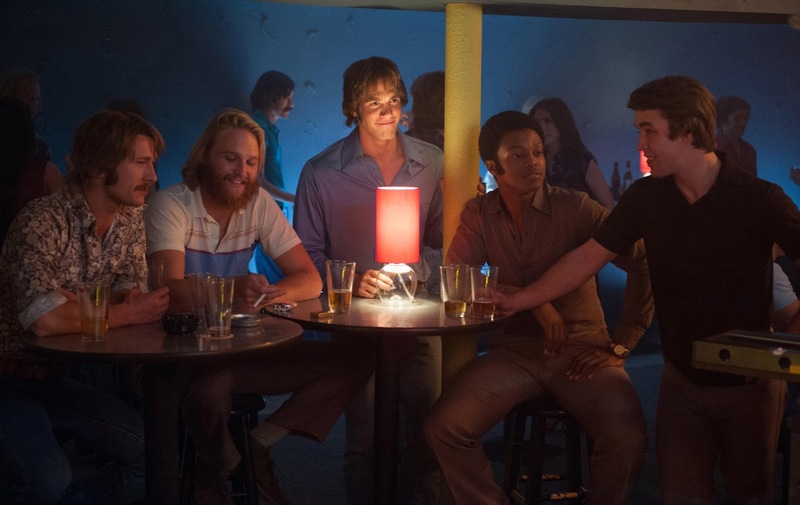 The 1980-set “Everybody Wants Some! !” is similar and takes it to the next step by addressing finding one’s identity when entering the crazy, fast-paced world of college. Director Richard Linklater, ever the one to capture the realities of youth by drawing from his own experiences, (he was a baseball player at his Texas college) presents us with a story about a team of college baseball players in the days leading up to the start of the school year. Linklater is also a master of the practically plotless film choosing to focus on interesting characters and witty dialogue. Here he gives us a bunch of baseball jocks and while it may be a turn off to anyone who didn’t play sports in college, Linklater manages to make typically unlikable characters into fascinating studies of human behavior. “Everybody Wants Some! !” which plays like a spiritual sequel to Linklater’s own cult comedy “Dazed & Confused,” is a delightful slice of Americana – all set to the pleasant sounds of the late 70s and early 80s. First of all, it must be said that like a majority of his films Linklater follows a very loose narrative structure and those looking for a truly compelling storyline need look elsewhere. “Everybody Wants Some! !” is all about the nostalgic atmosphere, characters, dialogue, and rockin’ tunes. And even though the film revolves around a bunch of baseball-playing college bros, Linklater manages to make typically unlikable caricatures into really likable fully developed people (though you’ll have to look elsewhere for many well-written female characters). It’s Texas, circa 1980 and our surrogate is Jake (Glee’s Blake Jenner in his feature film debut) an incoming freshman. He’s moving into one of the two houses for the Texas university’s baseball team. We’re quickly introduced to some other players who initially seem rather unappealing including Tyler Hoechlin’s star hitter McReynolds, Ryan Guzman’s Roper, Glen Powell’s Finnegan, Wyatt Russell’s bearded stoner Willoughby, J. Quinton Johnson’s Dale, and other freshmen Plummer (Temple Baker), Brumley (Tanner Kalina), and redneck roommate ‘Beuter’ (Will Brittain). On the surface, these characters seem like typical dumb jocks; you instantly stereotype them as dumb idiots but Linklater slowly lets you get to know these guys. The film takes place in the days before school begins with an onscreen text doomfully counting down to the start of classes. The film’s story is basically watching Jake become accustomed to his new college life while he pursues different parties as he and his teammates ogle the coeds. While “Dazed & Confused” followed several groups of high school personalities (i.e., jocks, stoners, losers) “Everybody Wants Some! !” follows the jocks as they attend several different party atmospheres. The first night at college Jake’s teammates throw a huge beer bash. The next night they attend a disco and then head to a country bar, and even a punk concert. After Jake begins to pursue a cute theater major and some of his friends attend an artsy theater party. Jake, like most incoming college students, attempts to find his niche amongst his fellow jocks as no one should be pigeonholed to one group. Jenner is extremely appealing here as are his other co-stars. I’d say Powell feels like the MVP here though everyone gets their moment to shine. Oh, did I mention the film’s awesome soundtrack filled with glorious 70s and 80s tracks? The film’s title is, after all, also the name of a Van Halen song (with double exclamation points sealing the deal) and the film's story easily reflects the title's proclamation.